Aidan lives in a fishing village in England. His one brother has died in the war, but George is still off fighting. His parents are grieving Trevor's death and are weary of the war. Aidan and his friend Sally have fixed a broken radio and have been hearing transmissions about upcoming events, and when they find out about the all-call for help at Dunkirk, they make their plans. Aidan's father, quite rightly, doesn't want to risk the family boat in this endeavor, and forbids Aidan from going, even locking him in his bedroom. With Sally's help, he escapes, and the two take off for the action. They are able to help quite a few soldiers get to safety, and even help George, but since Sally has eaten for a while, she becomes faint and is handed off to the care of a family helping as well. The Battle of Dunkirk was a very serious one, and while local fisherman were influential in turning the tide, it was extremely dangerous, and several of our main characters are injured. Strengths: This is a quick pick for reluctant readers who need to have a book about World War II for a project, but are not really interested in the topic. It has very nice notes and glossary at the back, and is told in simple, direct language. The cover is appealing and action packed. Weaknesses: The choice to use the present tense is very odd for a historical fiction book. I also felt that the grief of the parents did not accurately represent the way that grief was dealt with at this time period. What I really think: This is a serviceable recounting of a standard event with a decided We Were There feel, but it doesn't cover any new ground. 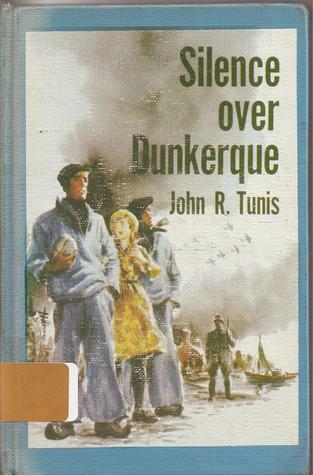 I rather prefer John R. Tunis' Silence over Dunkerque (1962), and my library copy looks almost exactly like this picture. A rebind when rebinds were done correctly and lasted forever! 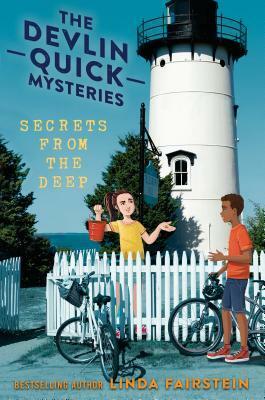 Devlin and her friend Booker, along with his young cousin Zee, are vacationing on Martha's Vineyard when Zee finds a gold doubloon while Devlin is taking water samples for her summer science project. They investigate to find out whether it is real, and soon uncover a series of historical mysteries as well as modern ones relating to how the coin came to be washed up on the beach. Devlin uses her investigative skills and connections that she has because her mother is the police commissioner in New York City. Along the way, the children learn a lot about the history of the area in the 1700s when pirates roamed the seas. Strengths: This had a nice feeling of place, since the history and locations of Martha's Vineyard are showcased so nicely. There are supportive, helpful adults who assist the children and keep them safe. The mystery is solid. Weaknesses: Like the first book, this showcases a lot of privilege that feels odd and unrealistic to me in this day and age, at least in the mid west. Devlin uses her mother's position to get questionable testing done, and she's very close to be rude to adults she considers inferior. What I really think: The first book has not circulated well, so I didn't buy Digging for Trouble and will probably pass on this as well. Prince Veera and his friend Suka are very interested in the king's court, and when the king is ill, decide they would be able to make good decisions concerning the welfare of the people. They end up having very good ideas about how to cleverly serve justice, such as allowing the baker who wants to charge for the smell of his bread to hold the payment but then return it, having enjoyed the feel of having money. The boys get into some more mischief, just hanging out, but the eight tales hinge on their clever ability to decide how cases should be handled. Strengths: This was a fun, short book of stories with two engaging friends learning to be just and clever. I enjoyed reading it. Weaknesses: I could have used more background information about when this what set, and about details of living in India. These are apparently original tales, but do have a classic feel, so I wonder if they are based on folk tales. 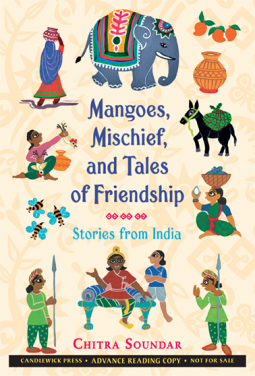 What I really think: My folk and fairy tale books tend to only circulate if teachers assign a project with them, and it's been a while since the 6th grade has done the retelling of a folk tale, set in another country. This would have been absolutely perfect for that. It's certainly good on its own, so I will probably buy it if I have money left. It's just not going to circulate terribly well, which is too bad. Niles and Miles are on summer break, and they are spending most of their time spying on Josh Barkin, who is at the Yawnee Valley Yelling and Push- Ups Camp with several of his friends. He was originally sent to the camp as punishment, but it fit his warped personality. His father, Principal Barkin, loves to hike and camp as well, but he can't go with Josh, and his wife has also declined, so he is spending his time away from his office wandering in the same woods. Miles and Niles have the sort of encounters with Josh that they normally have, but there are some nice moments of mutual understanding between our pranksters and Principal Barkin. Like summer, nothing of particular note happens, but it is sunny and amusing. Strengths: This is a funny notebook novel that is much better than others with which my students are obsessed. Sort of that whole-grain-toaster-pastry feeling. I did particularly like the new relationship with Principal Barkin, who has always been a rather sympathetic character for me. The prologue is a surprisingly brilliantly written paean to summer. Weaknesses: Josh is over the top terrible, and I had trouble believing the summer camp was so close to where Niles and Miles hung out. What I really think: Fun, distracting series that started out really strong and has a loyal following, although I don't know that the books are getting funnier (like Hamster Princess). Maybe the next book. Sanity's latest science project, which she has been told NOT to do, is a three headed mutant kitten, whom she has been managing to feed by conducting another project to clone meat. When the kitten escapes, things start to go badly wrong. The space station on which she and her friend Tallulah live is imperiled by duct rats who are chewing through piping and drinking coolant, causing massive leaks and failures. Even though the girls have been told not to do any more projects, they don't really listen, and continue to try to find and keep their pet, Princess Sparkle Destroyer of Worlds. Unfortunately, there entire community is threatened, but they are allowed to fix the problems and save the day. Strengths: This is on trend for many reasons-- STEM content, girl power, and multicultural cast. Graphic novels are always popular. Weaknesses: I was deeply bothered that the girls ignored scientific safety to the detriment of their community, but their parents let them keep making bad decisions. Students will not be as bothered. What I really think: Definitely waiting for a prebind. This was a rather difficult read, with lots of small, scientific text. My struggling readers are the only ones who pick up graphic novels, and they might find this difficult. My readers who might be interested in science and could understand this tend not to pick up graphic novels. This is just the case in my school; I'm sure this book will win lots of awards and be a popular choice in many libraries. I'm not a generally polemic person, and I certainly don't care about military strategies. My feeling is that if you aren't willing to go completely Carthago Delenda Est on your enemy, you probably shouldn't be fighting in the first place. Also, haven't seen a football game since my cousin was a majorette in 1974. I'm not a huge fan of the Jeep loads of WWII books or the lockersfull of sports books I've read in my life. But my readers are. 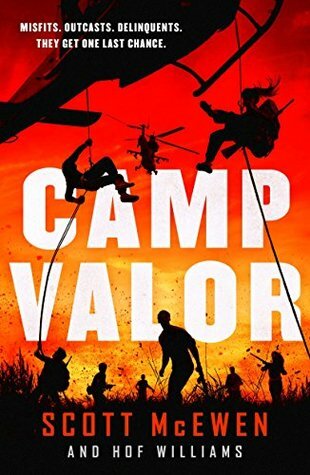 There is something about sports books and military adventures that appeal to a certain number of readers who like the adrenalin, the suspense, and the action of these intriguing tales. This new Michael Spradlin is sort of a mix of feats of physical prowess and militaristic strategy, all wrapped up in a nice, gung-ho burrito of Can Do spirit. The characters fight extreme odds with steely determination-- I could just feel them squinting into the distant with their teeth clenched and their resolve firm. 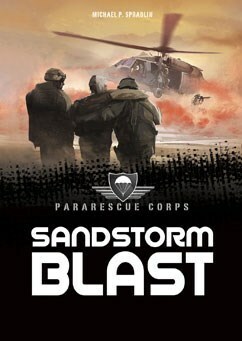 The details of the training to be a pararescue jumper, and the vivid descriptions of the various terrains and forces of nature that have to be fought against are going to have children whiteknuckling the covers of these short, fast moving stories... and asking for another one as soon as they are finished. Readers of Sherman's Bloodlines and Bowen's Shadow Squadron series will adore these books. My only complaint is that these are only available in a very expensive "library binding", which is really just paper over boards, and needs a lot of tape to hold them together. They are very expensive, so a nicer binding would be helpful. Also, the E ARC came with all four books together. This is always a problem, since I assume all e books are one volume, and by the time I figure out they're not and try to write a review... so here are the Goodreads synopses. Just buy them! The pararescuemen have been worked to near exhaustion bringing in downed pilots, wounded soldiers and Afghan Nationals. When a mission goes horribly wrong and they are stranded behind enemy lines, they must fight their way to freedom. 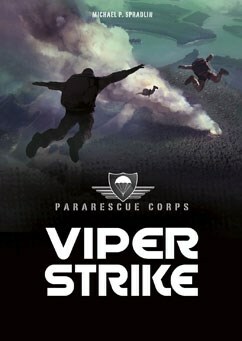 When the U.S. ambassador to Venezuela's plane is shot down over the Amazon jungle by separatist rebels led by a clever rebel leader named The Viper, the parerescuemen's mission of leaving no one behind becomes a tense game of cat and mouse in the dense Amazon jungle. 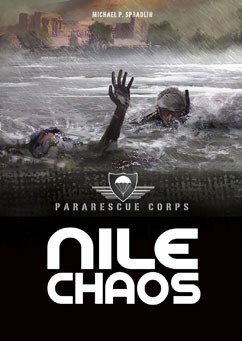 The PJs are dispatched to Africa to provide humanitarian relief after massive flooding along the Nile. When their efforts are thwarted by local War Lords, the PJs must go on the offensive to bring food and medical attention to the local people. 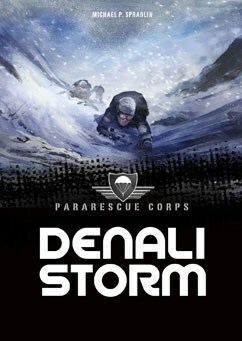 When a US Army training mission on Mount Denali goes badly due to an unexpected blizzard, a squad of Pararescuemen must rush to their aid in some of the harshest conditions on the planet. Coming soon: Spradlin's brilliant mix of fiction and nonfiction in the Medals of Honor series! 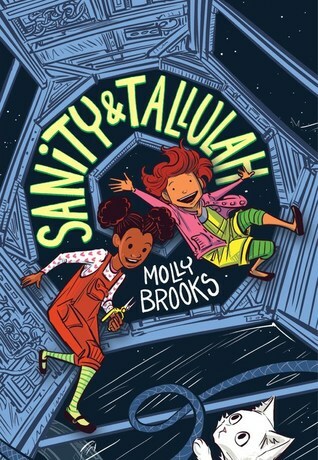 Abby is excited that her nana is coming to stay with her and Jonah while her parents are away, but when she gets an invitation to come to a sleepover at Penny's house, she's mad at her grandmother for not letting her go. She plans to sneak away via the magic mirror, and is not happy when Jonah tries to join her. 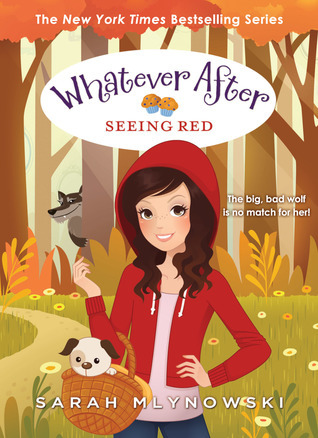 Instead of getting to Penny's house, the two end up in the story of Little Red Riding Hood. Red (aka Lali), is taking muffins to her Dadi (grandmother) and knows about the wolf. She's not overly concerned, but Abby is. When the wolf, Owen, shows up and claims he likes to eat people food but not people, she doesn't quite believe him. If any grandmother deserved to get eaten by a wolf, it would be Dadi. She's cranky and mean to Lali, complaining about her muffin and tea and telling Lali she's the worst granddaughter ever. When Abby and Jonah get in a bit of a spot, their own grandmother shows up to save the day! It turns out that she, too, had a portal when she was young, but didn't get to travel into fairy tales quite as much. With her help, the siblings are able to understand both Owen and Dadi better and arrange Red's situation so that everyone is happier. Nana is impressed with Abby and Jonah's ability to deal with fairy tales, and understands why Abby was upset about not going to Penny's. The next adventure in this series will involve Jack and the Beanstalk. The inclusion of Abby's grandmother was a nice addition to this lengthy series, and added a fun new dimension to the traveling through portals. Nana didn't have a fairy like Maryrose to guide her through her own adventures, and there is not very much about the fairy in this story, but I'm sure that she will be more involved in future stories. Lali's story is a bit different as well-- even though Abby generally orchestrates some change in the fairy tale character's lives, she seems to step in even more here. Dadi's husband has died, she doesn't want to leave her cottage to go live with Lali and her mother, but she needs someone to take care of her. Owen is at odds with his brothers and sister, who do think humans are tasty. He is also in need of some love and attention. Abby's solution is clever and fun. The part I liked best was actually Abby's interaction with her grandmother over Penny's party. Yes, ten-year-olds love their grandmothers and want to hang out with them, watching movies and reveling in grandma's good cooking, but missing an opportunity to hang out with friends is crushing and apt to end with the kind of bratty behavior Abby exhibits. 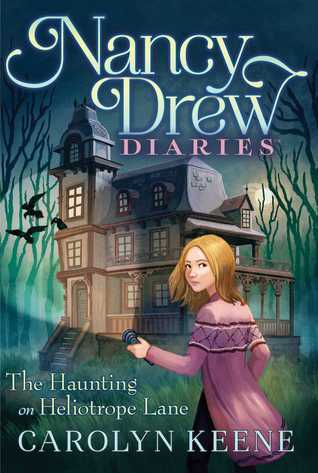 As popular as this series is, I'd love to see Mlynowski turn her hand to some new, stand alone middle grade titles. Readers who have moved beyond Daisy Meadows magic fairy and animal books, are comfortable with Pearce and Stiefvater's Pip Bartlett series, but are maybe not quite ready for Buckley's Fairytale Detectives and Colfer's Land of Stories will enjoy this fun, tween story of traveling into classic fairy tales and saving the day. My readers really do like this series, but it's a LOT of books. I get tired of any series after about five books, and series tend to be a library nightmare when they get to be this long! What happens is that there's a series like Rodda's Deltora Quest (2000), which circulates steadily for a number of years until someone loses book four. There's no way to replace it (it was published in paperback but purchased in a prebind), so what to do? I'm sure these will remain available for a while, but it is always my irrational librarian fear! (Or, like with Diane Duane's So You Want to Be a Wizard series, you have to repurchase the first book twice because it falls apart, yet no one ever makes it to book ten!) (Can you tell I've already thought about weeding for this year? Somper's Vampirates (2005) is definitely on the chopping block for this very reason-- first book is in tatters, but only one person has checked out book five and six. 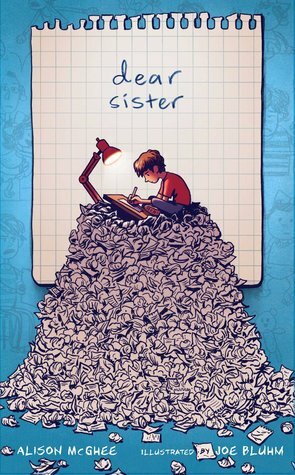 When an eight-year-boy suddenly has a baby sister thrust into his life, he writes her a series of notes and letters, heavily illustrated, that tell the story of her effect on his life. From portraits and progress reports of a one-year-old until the boy leaves for college and has to say good bye, the ups and downs of their relationship is captured. Mostly, the sister is annoying, and common themes pop up-- she ruins everything, wants to be read to over and over, and gets in his way. Still, he clearly loves her, and is sad when he finally has to go off to college. Strengths: The size of the text and the placement and amount of pictures is perfect for a middle grade notebook novel. The use of a medium blue along with the black and white makes for some very attractive pages. I enjoyed how Bluhm made the drawings look like they matured along with the main character. Weaknesses: The brother seems overly negative for most of the book. It's just not what I've seen in families who have large differences in ages. What I really think: David Lubar's Let Sleeping Freshman Lie is a more interesting take on this topic. If I bought this, it would probably circulate on the strength of the illustrations alone, but I'm not sure how the nostalgia would resonate with an actual 11-year-old. I'm conflicted about this one. Parts of it exceed my dose of gruesome, human-on-human violence. However, I always say that I won't monetarily support authors who do this. This was a free copy. I've already read it for YABC. It's not completely inappropriate, it's just... too much. I think I may give the book to one of my 8th grade readers who told me his first day that he didn't read, but has continued to soak up every book I've given him, and ask him what he thinks. Well, I did take this opportunity to educate myself on Fortnite, and found this Guardian article most helpful. I was especially glad to find out that this is the genesis of the ridiculous looking The Floss dance. While my girls were growing up, I had a very draconian, half hour of ALL media policy. This made Runescape with dial-up frustrating for them. The fact that this game involves shooting people would have made it verboten in my house, and the fact that it's colorful, cartoony violence actually makes it worse in my opinion. 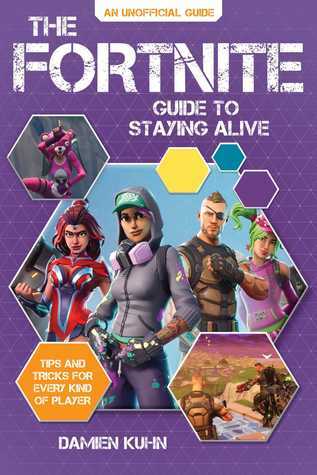 So, while this book could well be very helpful to children playing the game, I'm going to give a firm, resounding NO to having it in the library. No to video games, no to violence. My daughters would have known better than to even question this. Snub is a young gorilla living in prehistoric times. She has a family that included Silverback, Brother, Wrinkle and Teased, and they are very close. When Snub's mother has a new baby, Snub feels unloved, but that is a small tragedy compared to the eruption of a volcano. The lava displaces and kills many creatures, and Snub is separated from her family for a while. Food becomes difficult to find. Snub is eventually reunited with her family, and starts to feel more warmly toward Breath, the new baby. When non-gorilla creatures stumble across her path, Snub ends up caring not only for her new sibling, but for this new creature as well and must navigate her changed world not only to save herself but to save her new charges as well. Told in the same impressionistic, verse style text that Applegate's The One and Only Ivan utilizes, this delves into the thought process of Snub, highlighting her all important family relationships but making her a functioning member of her larger society as well. Like Beckhorn's The Wolf's Boy, this is a rare look into prehistory. 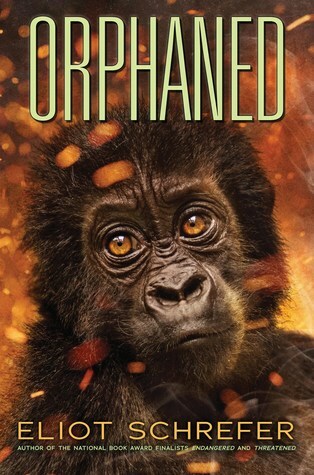 Schrefer has done a lot of research on an enormous amount of gorilla behaviors for the previous volumes in this series, and going back into prehistory to show a very early ape-human interaction is a nice touch for the conclusion of this quartet. Hand this to readers who want to increase their knowledge of primate behavior or who want a fascinating glimpse into a time when the world was completely undeveloped! I have Endangered in my collection because it was a Battle of the Books title one year, but it hasn't left the shelf in four years. Not something that will do well in my school. Sending the copy to another middle school in my district. Our main character, an unnamed girl being raised in a Nigerian village with five brothers, has big dreams for herself. She works very hard in school and hopes that she wins a scholarship. She and her best friend Sarah also watch a lot of Nollywood films about young me in arranged marriages to village girls who instead are secretly in love with female students at the university where they study. Sarah seems to just enjoy the romance, but this further motivates our protagonist, who has her heart set on the well-educated and polite pastor's son who offers to bring her books to read. Her father, who loves to listen to radio news, also believes in educating women, so her chances look good. However, the Boko Haram is running riot over Nigeria, and as they get closer and closer, worry increases. 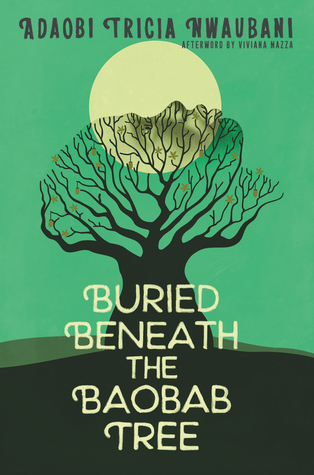 When her mother is off in Jalingo for a wedding, the Boko Haram attack her village, and the girl and her friends are taken into the Sambisa forest. The first thing the group does is to convert the girls to Islam, which the girl does willingly. She has one friend who is Muslim and also married and pregnant, and she is treated a bit better. The girl watches as the women are all taken by the soldiers, and she and Sarah are glad they are still girls, until they realize that they, as virgins, are being saved as a special reward for soldiers. The girl is given to a soldier who wears a mask and goes by the name of Osama, and he treats her roughly but is not overly unkind. Sarah starts to believe the indoctrination, even though the girl has learned from her Muslim friends that Boko Haram's ways are not really religiously accurate. As Sarah becomes more and more devout, she even turns the girl in for heresy, resulting in her beating, and eventually decides to work her way into paradise by wearing an explosive vest and setting it off in a crowded village. The girl starts to believe that she will never escape, but is suddenly rescued by the Red Cross. Even though she is pregnant, she is able to make some plans for her future. There is a lengthy afterword by journalist Viviana Mazza detailing the interviews that went into writing this book. Strengths: I have a student from Nigeria who is desperate to read about her homeland, and the adult books she has found are full of violence and adult themes. While this tackles the horrific kidnapping, imprisonment, and abuse the girls suffered, it is done is a middle grade appropriate way. 6th graders who pick up the book will sort of understand what is happening, but won't be any more enlightened about the mechanics. I would love to see this writer come out with a book just about daily life, because it's important for my readers to understand that in most parts of the world, school is a treat, and sanitary products we take for granted are extremely valued. Realizing that family dynamics and relationships between men and women are very different in other countries is important. Weaknesses: There are a few moments that are very uncomfortable-- I wouldn't give this to students younger than 6th grade. Also, the ending is not perfect-- very abrupt and unrealistic. 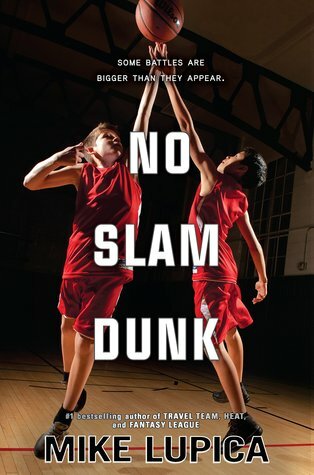 In this middle grade novel, though, it isn't horrible. What I really think: I'm going to purchase this one, since the discussion of daily life in Nigeria by an #ownvoices author is so valuable, and I appreciate the circumspect way in which this very difficult topic was written. Ethan's family is struggling after the death of his mother from cancer. Sarah, who has Down Syndrome, wants a puppy desperately, and has to rely on Ethan for much of her care. Their father, a comic books artist who killed off his most successful character, is stuck. He can't draw, he can barely get out of bed, and he finds it difficult to care for and interact with his children. When an ink blot comes out of his sketch books and is found by Ethan, Ethan thinks it might solve some of his problems. His classmates have assigned him to do the drawings for a school project, and he can't really draw well. 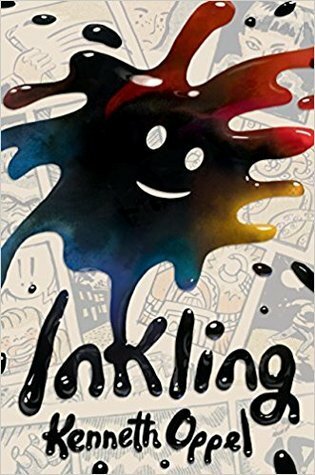 Inkling, however, absorbs ink from the pages of books and uses that ink and the knowledge of design to create new artwork. After Ethan uses him, the father finds that Inkling can turn out new work for him, and this gives him hope even though it isn't a real solution. When someone tries to take Inkling and use him for evil, Ethan must get him back, but also find some more permanent solutions to his family's dysfunction. Strengths: It's a fun concept-- an ink blot that learns and grows. The accompanying drawing add a bit to the story, but even more of them would have been great. Sarah's interactions with Ethan are realistic and nicely done. Weaknesses: If families were portrayed as being unable to go on when they had a child with Down Syndrome or another condition, I don't think people would take kindly to that. It would be insulting to say that having a child with a difference is SO BAD that the family can't function. However, at least half the time a middle grade parent (or sibling or friend) dies in a story, parents becomes dysfunctional. I don't think this is realistic, and I do think it's insulting. It also occurred to me after reading this that I had about four friends who lost parents as children (in elementary school), and it was never a topic of conversation, and I never got the feeling that the family was sad and dysfunctional. I know, I know. I always complain about this, but there are SO MANY books where this occurs. What I really think: Debating. This is rather slow and introspective, and there aren't as many pictures as there need to be for a true Notebook Novel. I'm not sure I have readers for it, but I'll show it to a few students and see what they think. Mark is 4'7" in middle school, and takes his share of abuse in the hallways, although he has some friends. As summer approaches, he is bound and determined to put on some weight and muscles, and sends off for many aides found in the back of a comic book. (But no sea monkeys. Drat!) He has a cool bike that takes him all over town, and when the original Star Wars movie premiers in May of 1977, he and his friends are there at the local theatre, waiting in line. His brother and sister aren't always terribly helpful, but are there for him when he needs them. Mark's biggest interest is drawing comic strips, but after seeing Star Wars, he is bound and determined to do make a MAD Magazine style movie parody of it. His parents are supportive of his attempts, even in the days when film meant actual, expensive film and processing, and he gets some small acclaim for his attempts, even if he doesn't get a whole lot bigger over the summer. Strengths: There are a lot of middle school boys who are very small, but it doesn't show up in literature. My brother was 4'10" when he started high school in 1981, so I know it can be a very significant concern. This is a historical fiction graphic novel, much like Holm's Sunny Side Up, and there aren't a lot of those. The blending of historical details with concerns that students still has makes this very engaging, and the Star Wars tie in can never go wrong! Weaknesses: I wish this had come out about ten years ago. The current batch of middle school parents were probably just being born in 1977, making this not as helpful as a generational bridge. What I really think: Definitely purchasing, but may wait to see if there is a Follett Bound available. Graphic novels have a shelf life of about two years in my library, and they are very expensive. 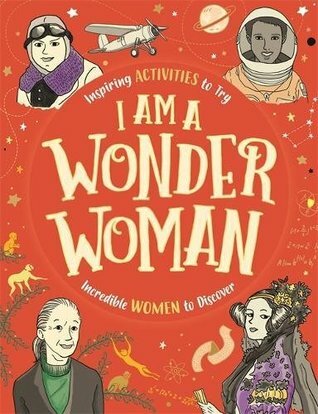 This book covers over fifty famous and impressive women from all walks of life, over a huge span of years. 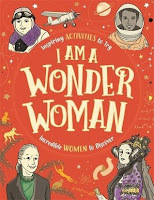 From the ancient Greek Hypatia to paralympian Ellie Simmons (born 1994), each woman is showcased with pertinent information about her life and impact on society On the opposite page, there is a suggested activity, writing exercise, or project that readers can do while thinking about their own possible impact. The entire book is illustrated in shades of orange, teal and beige, and is one of those books that begs to be taken apart, laminated, and made into bulletin boards! It would also be a perfect gift for the young feminist in your life! While there are a large number of women who are well-covered (Helen Kellar, Harriet Tubman, Marie Curie) there are also some of whom I have never heard, and some from different parts of the world, making this a great starting point for further reading about women such as Brita Tott, the Mirabal sisters, and Xian Zhang. My one quibble is that there seems to be no rhyme or reason for the order of the entries-- my own preference would have been chronological, but geographical would have worked as well. My daughters would have loved this when they were young! As Christmas approaches, Timmy is ready to give up his detective business, but he has one last mission: to help Total find his brother. He's also not entirely happy to be living with Doorman Dave, since his mother married him. When he is assigned a film project for class, Timmy goes into full egotistical mode and writes a script all about himself. He is challenged by Molly, who thinks the script is not happy enough, and Tom John, who is made director by the teacher and who disagrees with Timmy's artistic vision. While searching for a bar where he can stage a scene from the book, Timmy encounters his birth father, with whom he last had a less than successful encounter in Florida. 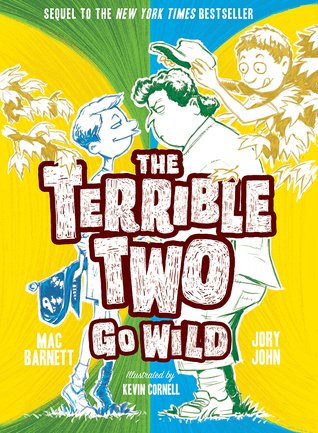 The movie is one train wreck after another, and working on it puts Timmy at odds even with his best friend Rollo. After much faxing and investigation, Timmy does manage to locate Total's brother, and soon the bear is leaving. 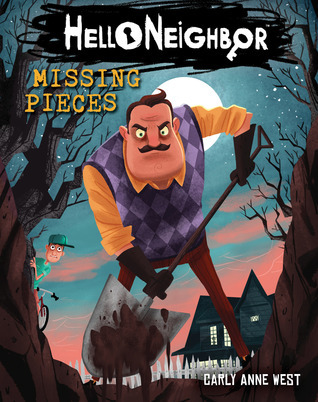 Can Timmy survive the combined stress of keeping his father's location a secret, dealing with the school play, and losing his trusted (if potentially imaginary) companion? 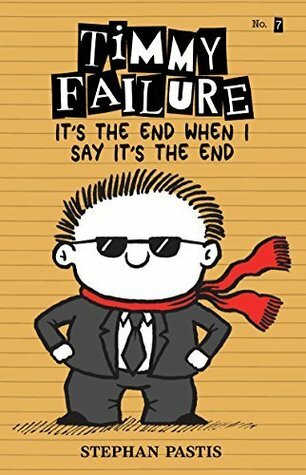 Filled with jokes, odd names, and improbably situations, the Timmy Failure books are fun romps into the world of the unpredictable. Even after reading all seven, I'm still not entirely sure if Total is a real polar bear, or just something Timmy has made up! Readers who enjoy the vaguely film noir style of Rylander's The Fourth Stall, Hale's Chet Gecko mysteries and Ferraiolo's The Big Splash will revel in Timmy's attempts at running a detective agency, and his egomaniacal style complements this nicely. The real draw for many readers will be Pastis' illustrations, which are similar in style to his Pearls Before Swine comic strips. 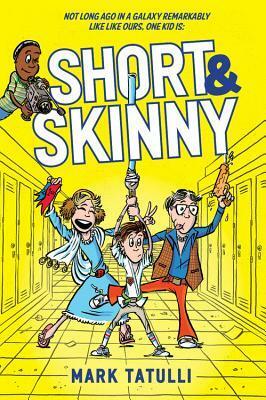 This is one series that my students who won't read anything but Wimpy Kid books have been eagerly checking out. While not a personal favorite of mine (IS the polar bear real? Seriously, this is a big problem for me! Plus, the weird names always bug me. 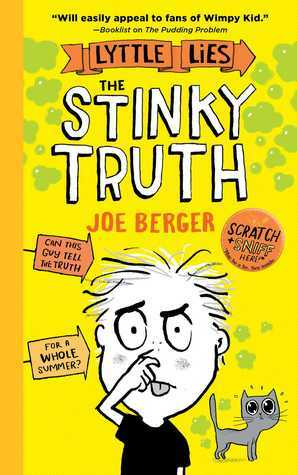 ), this series is a great addition to the list of middle grade Notebook Novels that includes Berger's Lyttle Lies, Tashjian's Einstein the Hamster books, and Ignatow's Popularity Papers. Jorge struggles with his role in the school. He is an athlete, but doesn't much care for the way the other members of his team act. He has a huge crush on Jazmine, and asks her to the big athletic ball, but struggles with how to talk to her on a daily basis. There's lots of boy/girl drama at school, with people breaking up and getting back together, and Jorge doesn't want to be part of that. He enjoys working with the newspaper on the sports beat, and has a good friend in Liv, who helps him understand a bit about Jazmine. There are lots of current social topics discussed in this book. Coach Rashad delivers perhaps the first "body autonomy" speech in middle grade literature-- students are warned that no one is allowed to touch them without their permission, and that a teacher should be contacted if someone does. Of course, some of the boys think this is funny, but they are swiftly put in their place. There is also some cyber bullying, when Garrett doesn't log out of Jorge's account before getting involved in group chat and says mean things about Jazmine. The dance goes well, and Jorge and Jazmine continue their tenuous romance. Strengths: This is definitely a much higher quality graphic novel series than many. The stories are substantial, the characters well developed, and the drawing very pleasant. The understanding of middle school social interactions and volatile romance is good. Jorge is a quiet, athletic character who struggles socially, and we don't have too many characters like that in middle grade literature. Weaknesses: This is a bit on the preachy side on several topics, but students won't care. What I really think: Definitely purchasing, and with any luck someone will lose the copy when it gets too worn out. Hope that a replacement will be available. Graphic novels frequently fall apart or are lost by students, and often can't be replaced! After his escapades in The Pudding Problem, you would have thought that Sam would have learned his lesson. No such luck. This time, he volunteers his mother to run a Zumba-thon at the town festival, and she's less than pleased to find out where his lies have taken him. She tells him that if he wants to see the much anticipated Cry Wolfe, the first Wolfe Stone movie, he will have to go six weeks without telling any lies. He tries very hard to do this, and gets in various scrapes during the process, but it is looking like he might be able to make it, even though he's had to practice telling his grandfather that his home pickling projects are horrible... but in a polite way. As the festival approaches, Sam gets himself into a pickle of his own with a tray of pastries for the event. Can he manage to extricate himself but still tell the truth so that he can see the movie? Strengths: Like Big Nate, Same means well but frequently gets carried away by his own misguided enthusiasm. This is the definition of middle school behavior! I really like the illustrations, and the fact that there are some comic strips inserted into the story, along with page illustrations. Students enjoy stories about summer vacation, and the UK setting is a bit exotic. The family is supportive (mom throws herself into her Zumba assignment and dad plays guitar for the festival) and present, and Sam has good friends as well. This would be a great choice for first grade on up. Weaknesses: A bit on the preachy side, but it doesn't get too overwhelming. What I really think: Definitely purchasing. Sam is a much more sympathetic character than Greg Heffley, the drawings and page design are much nicer than many notebook novels, and there is the adorable Pudding the cat. Nicky's family moves around a lot, and he gets tired of having to adjudt to new towns, new schools, and new friends. This time, his mother has a good job at the university in Raven Brooks, so he's hoping they can stay. 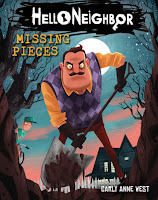 He meets Aaron Peterson, who lives across the street, and the two boys have lots of adventures, breaking into the old Golden Apple candy factory and appropriating electronics for their inventions. There's something a bit strange about the town, and about Aaron's father, and after some research, Nicky finds out some of the back story. 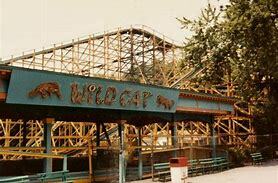 The Golden Apple company created an apple themed amusement park, and Mr. Peterson was the engineer who designed the rides. Unfortunately, a seven year old girl was killed after being thrown from a ride that didn't have appropriate safety equipment installed on it, and even though there was no law suit against Mr. Peterson, it ruined his career and made him slightly disturbed. After a tragedy affects the Petersons, Nicky starts to think that maybe there is an even bigger secret hiding in the house, and he attempts to find out what it is before even more bad things happen. Gino, Alex. You Don't Know Everything, Jilly P.
Jilly's is very excited when her mother finally has her baby sister, Emma, who is adorable, even if she cries a lot. When it turns out that Emma may have some issues with her hearing, it's good that Jilly has a close knit extended family that includes her Aunt Joanne, Joanne's African American wife, Aunt Alicia, and her children Justin and Jamila. She also has a support network in a chat community for the Magically Mysterious Vidalia trilogy, a fantasy series she really likes. One of the other members of the group, Profound, is deaf. He is very politically aware of issues facing the Deaf community as well as the African American community, and often brings Jilly to task when she makes comments that are offensive, even if she doesn't mean them to be. Jilly's parents are not entirely sure how they should proceed with Emma, because they are getting conflicting opinions from the medical professionals they consult. One says they shouldn't even encourage Emma to wave, although some think starting sign language is a good thing. They do have her fitted with hearing aids, and attend an event with families with deaf members in order to learn more. Profound, whose real name is Derek, has invited Jilly to come to the event, and she's glad to meet him in person. It's helpful to her family to learn more, and Derek and Jilly continue to chat online. Thanksgiving and Christmas are difficult for Jilly, because the rest of her extended family are not as welcoming of Joanne and Alicia's family. It doesn't help that there are many incidents in the news about racism, including some that hit very close to home. Jilly must confront her own privilege and speak out when she hears unjust comments, knowing that Emma may face some issues of her own. Strengths: Gino's notes in the back of the book are very helpful, and indicate that while she is not herself deaf, she was raised by deaf parents and has learned sign language. My students are invariably fascinated by sign language but don't really know anything about the Deaf community, so this is a good way to raise their sensitivity. Cochlear implants are discussed at length; I had a student a few years ago who had those as well as an interpreter in class, and this would have been a helpful book to have had.There are other timely social issues as well, and Jilly's warm and supportive immediate family are lovingly portrayed. The online romance is conducted within the bounds of safety, and it's interesting to see how the connection changes when the children meet in person. The cover is very bright and attractive, and does show Derek's hearing aid. How much they have changed since the days of Cece Bell's El Deafo! Weaknesses: It didn't seem quite realistic to me that there was so much tension at the holiday meals, but every family is different. Even my own Uncle Mike is able to reign himself in during brief dinners with my family, which has a variety of different groups represented. Also, the mother baked pies on the day of the holiday to take traveling. I can't say I've even had time to do that! What I really think: Gino states (and this is from the E ARC) that "books and stories are tools for talking about contemporary issues", and this would certainly be helpful in addressing several different ones. Kiva is being raised in ancient Egypt, and one of her best friends is the prince, Seth. However, since his mother's passing, he has not come to school and has distanced himself. Kiva is training to be a healer, so when an earthquake causes some damage and injury to her community, she tries to help. However, Seth passes away, and she is not able to do anything. She realizes that her mother is going to allow her to be sacrificed and put into Seth's tomb in order to accompany him to the afterlife. 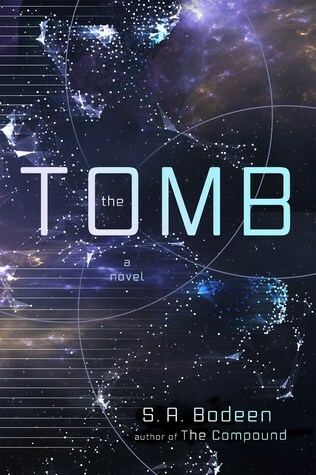 She thinks she has two months to plan her escape, but she wakes up on what seems like the next day only to find that it is the day of the funeral. Things get weirder after that, and Kiva finds that her whole life has been a lie. She and Seth are really in stasis on a space ship, her mother is a hologram, and she's really from the US of the future and not from Egypt at all. Not only that, but the ship the two are on is in trouble, and when they go to find a part for the ship on one of the other units sent forth to evacuate the Earth, they find nothing but trouble. Will they be able to save their ship, or even themselves? Strengths: This is a great length, has a nice light romance, and definitely is a good example of kids saving the world. I'd like to see more science fiction/space adventure, and Bodeen always does such a good job at putting scientific details into her work. Weaknesses: I kept thinking of Haddix's Running out of Time, which starts with a similar premise. The Egyptian details are not quite right, which is addressed by Seth later in the book, but which made me uneasy and made it hard to get invested in the story, somehow. What I really think: This cover would not be appealing to my readers (I have several similar ones that just don't circulate), and it's hard to get into the book at the beginning, so I think I will pass, even though Bodeen's other works do very well in my library. Isabella's parents are divorced, and she lived with her mother in Cincinnati while her father worked in California. Now he is back, and they switch off weeks, meeting at a local mall for the trade off. With her mother, who works as a waitress, she lives in an apartment and has to worry about vehicles working, but with her father, she lives in a posh house in Indian Hill. Her mother's boyfriend, who is white like her mother, confesses that his family was very racist and abusive when he was growing up, and he feels bad that he was too scared to oppose them. Her father's girlfriend is an interior decorator who has a son, Darren, who is older than Isabella. As her parents' relationships become more serious, Isabella gives more thought to her identity, as well as to her blended family. 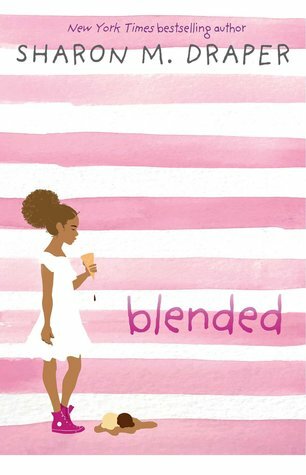 At school, she has some good friends, and doesn't think much about her racial identity until one of her friends is threatened and everyone at school is thinking about race. 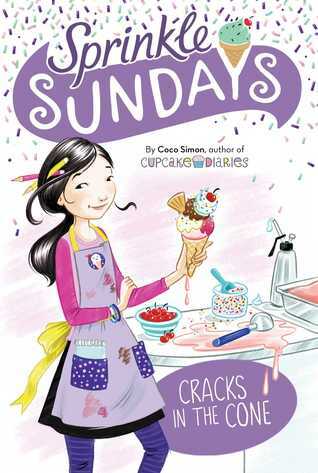 Isabella's big concern is playing piano, but when she and Darren stop for ice cream at the Hyde Park Graeters before her big recital, they run into problems that end tragically. Strengths: This was a good attempt to bring current social concerns to a middle grade level. Draper has done a lot of more Young Adult books with these themes, but her younger books haven't addressed them as much. I have a lot of students who are biracial, and there are not many books (Frazier's Brendan Buckley and The Other Half of My Heart being notable exceptions) directly addressing the difficulties that sometimes arise. It was especially interesting that Isabella herself identifies more as black. Weaknesses: This is almost two books; one about the blended families, and one about the racial issues. I liked that they were presented together, but at almost 300 pages, it was a lot of information, and the two topics didn't always flow smoothly. What I really think: Definitely purchasing, if only for the descriptions of Cincinnati (they HAD to be meeting at the Kenwood Towne Centre!) and the cover! Fun fact: I'm pretty sure that when I did a student teaching experience at Walnut Hills High School in 1989, Draper was teaching there! We never met, and all I really remember is the cigarette haze in the faculty room and my cooperating teacher telling me that if I ever saw a fight starting, I was to run and find "a man with a tie". O'Brien, Ann Sibley and O'Brien, Perry Edmond. 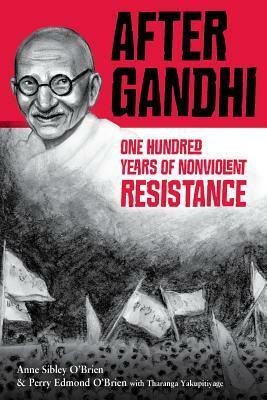 Starting with a complete but brief description of Ghandi's works and continuing with additional, updated information about current social movements, this book covers a variety of people and protests from around the world. Each chapter starts with an illustration that highlights the year of the protest, a description of a particular occurrence, a description of the problem and the method of resistance, and then a brief biography of a key figure, illustrated with that person's portrait. This is a nice way to reinforce the information, and made the book move very quickly. There were some events with which I was familiar, but a lot with which I was not. I can see this being a very useful book for research, pleasure reading, or for inspiring students to participate themselves. One notable omission, no doubt due to timing, is the student protests following the Stoneman Douglas shootings. Strengths: This author also did the fabulous novel In the Shadow of the Sun-- it took me a bit to make the connection! I really liked the way that the various movements were discussed, and the chapters were just the right length. This would also be very helpful in a high school history class to balance out the textbooks, which always concentrate on WAR instead of social history! Weaknesses: While I can understand the financial reasons for having drawings instead of photographs for each event, it was really not the same. Photographs would have added a LOT to this book. Perhaps in another ten years, for a new edition! What I really think: This new edition is in paperback. I will try to find a hardcover, but I don't know that it would get used enough to worry about it wearing out. 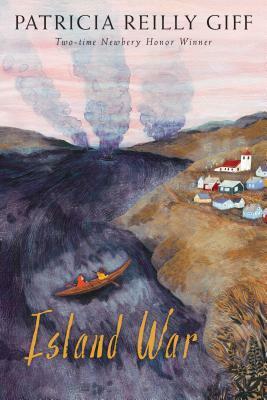 Izzy and Matt both end up on a small Alaska island in 1941. Izzy's father wrote travel logs until his death in a car accident, and her mother is a bird watcher, so the two decide to continue with plans he made to live on the island. Matt's gruff father rips him from a pleasant life on the East Coast with his mother and gives him a kayak, as if that would take the place of his own beloved boat. The two don't get along at first due to some misunderstanding, and both find it difficult to settle in to such a different life. It doesn't help when Pearl Harbor is bombed and the US enters into war. Rumors are that their island could be attacked, but when Japanese soldiers show up at their door, steal their food, and make life difficult, it is still a shock. The occupation goes on for several years, until the Japanese decide to take the residents back to Japan. Both Matt and Izzy are away from their homes when this happens, and don't get on the boat. Izzy goes to Matt's house looking for food, and plans to stay there for a while, so is surprised when he shows up. The two form an uneasy alliance and survive, along with a dog who was left behind. When the island becomes a battle ground, they must rely on their survival skills even more to remain safe until they can be rescued. 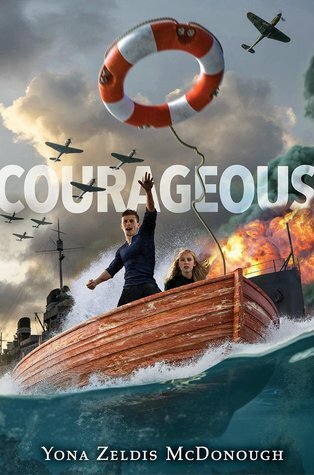 Strengths: This covers an unusual aspect of WWII, and is a good length. The story is intriguing and moves at a good pace, and readers who enjoy problem novels or survival tales will find this one amusing. This is very similar in tone to this author's Genevieve's War. Weaknesses: Having read Seiple's Ghosts in the Fog a while back at Gratz's Grenade more recently, I wanted a much more action packed story. I also didn't like either Matt or Izzy. What I really think: Definitely purchasing, since I always need more books on WWII for an 8th grade unit, but am personally a little disappointed. Zoe and her family have moved to Bright Field Stables from California. Her mother is from the small island in England, and is glad to return home, but Zoe has some trouble with settling in. She is thrilled to be able to have access to horses, and has made some good friends (Jade and Becky), but also has to deal with Mia, a wealthy girl who is rather mean. When a developer starts to resurrect a steeplechase race course on the island, the girls are all intrigued, especially since there are some cute boys whose parents work there. Mia's father is influential, so she is asked to participate in some of the first races, leaving the other girls to spy on her since they aren't included. They also feel that something isn't quite right about the way the renovation and planning are going, and get themselves in a fair amount of trouble while investigating. This is apparently based off of a British television series that is being shown in 2018 on Netflix. 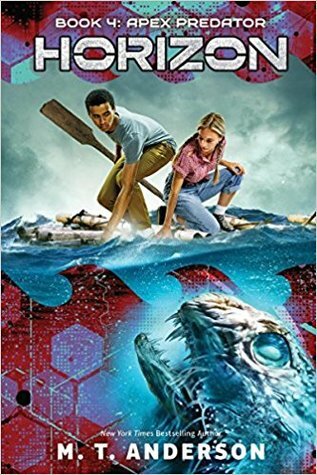 While I haven't seen the show, and wish I had read more information about Zoe's move to the island, the novelization stands up well on its own. Scholastic has a good eye for shows and movies that young readers are watching, and as much as I enjoyed Partridge Family mystery series when I was young, I really can't fault them! Zoe's close relationship with her mother and her sister, Rosie, is especially nice to see, and she does still talk to her father via Skype, which is a reality with which many children have to deal. Jade and Becky are fairly stock characters, but Mia is quite sympathetic even though she isn't always nice. It's a pleasant change to see a rich, mean girl portrayed as a human being rather than just a literary device, and it speaks well that Zoe tries to understand the other girl's perspective. Horse stories have a small but steady fan base, and it's always good to see a new one. Jessie Haas' Rescue is one of my recent favorites, and I love Hapka's Ponies of Chincoteague series. 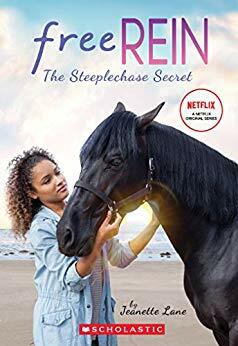 Free Rein, with it's wonderful Raven, will be a big hit with readers who either ride horses or would like to, and who also can get their teeth into a good mystery.